Who is most responsible for UConn’s success? 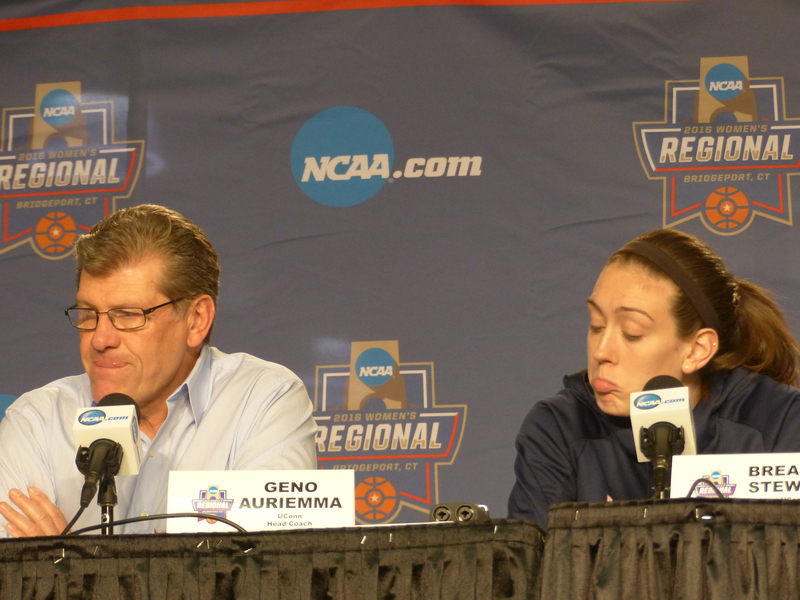 Geno Auriemma, left, and his star player, Breanna Stewart, ponder a question during a post-game press conference. Geno Auriemma is piling up the kudos for UConn’s success over the last four years in the NCAA tournament. The Huskies have been a juggernaut, particularly in the last two seasons in which they ran their most recent winning streak to 75 games. This latest UConn championship placed Geno ahead of a legend. John Wooden amassed 10 titles during his glory years coaching UCLA back in the 1960s and 70s. The “four-peat” also eclipsed the record of three-straight titles that Auriemma had shared with the Lady Vols legendary coach, Pat Summitt. Yet some people only begrudgingly give Auriemma his due, saying that his success has as much to do with three legendary players who laced their sneakers for the Huskies over the last 15 years, as it does his coaching prowess. Diana Taurasi was the driving force behind three of Geno’s titles from 2001 to 2004. Maya Moore’s incredible three-point shooting fueled the Huskies’ runs in 2009 and 2010, and Breanna Stewart was the key to the Huskies’ dominance in the last four years. 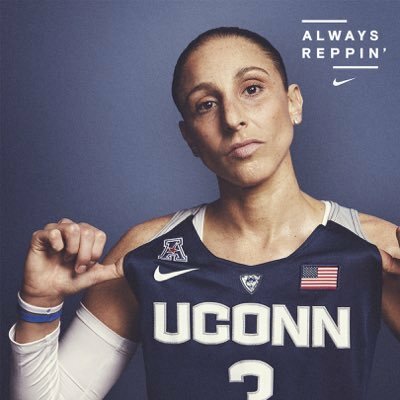 As Geno himself was quoted as saying in 2004, “The difference between us and everyone else is that we have Diana and they don’t.” And when he waxed poetic about the Huskies’ latest run, he said that he doubted he would see a player of Breanna Stewart’s caliber any time soon. If John Wooden, who coached UCLA from 1948 to 1975, were alive today, he would likewise tell you that he couldn’t possibly have had all the success he did from 1967-1975 if it weren’t for two legendary post players — and a complementary cast — who stepped on the floor for UCLA during those years. Kareem Abdul-Jabbar ruled the court for UCLA from 1966 to 1969. Bill Walton came on campus two years later and dominated the paint from 1971 to 1973. Both were also game-changers in the NBA and were inducted as soon as they were eligible to the Naismith Hall of Fame. But Wooden was a Hall-of-Famer too: a coach who brooked no argument from his players. As Walton recalls, it was Wooden’s way or the highway, even during the tumultuous early ’70s when colleges were teeming with anti-war demonstrations and counter-culture rhetoric. Breanna Stewart has become a shot-blocker par excellence thanks to her tremendous wingspan. So who deserves the credit? The stars or the coach? In some ways it is a chicken/egg argument. Someone had to recruit Taurasi, Moore, and Stewart and convince them to buy into a system that emphasizes teamwork, rather than individual accomplishments. Each of the three was the consensus high school player of the year when they chose UConn over the hundreds of schools that would have loved to recruit them. But would they have reached their legendary statuses without a coach who was constantly pecking at them (there’s that chicken-egg thing again) to be the best they could be? Taurasi and Auriemma butted heads on many occasions because of her brash ego. In his book Unrivaled: Jeff Goldberg recounts how Auriemma benched Taurasi for talking back to him during a game. “She has not been wrong for four years and it’s catching up to her,” he said after the game. When Stewart was a freshman, Auriemma was constantly denigrating her defense. A player with a wingspan like Stewart’s could rely on her physical advantage in high school. But defense against college players demands timing, intelligence, and a work ethic that high school players can only imagine. By not coddling his future stars, by treating them as imperfect specimens, by using older players and his coaching staff to help create buy-in, Auriemma saw to it that Taurasi, Moore, and Stewart reached their other-worldly potential early on in their college careers. 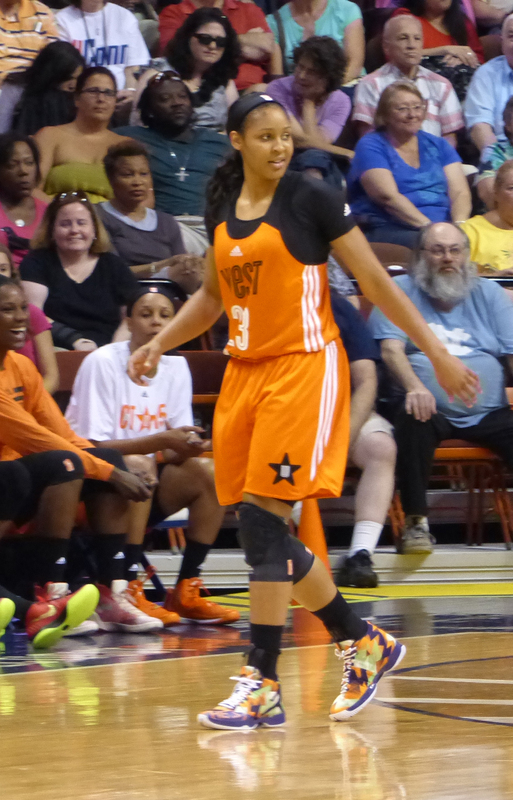 Maya Moore at the 2015 WNBA all-star game. As proof of what other-wordly players Auriemma developed: the WNBA team that drafted Diana Taurasi in 2004 (the Phoenix Mercury), doubled its win total (from 8 to 16 or 17) in each of the next two years and finally won the WNBA championship in 2007. Maya Moore, the first pick of the 2011 WNBA draft, has led the Minnesota Lynx to three championships in the last five years. Breanna Stewart’s WNBA career is just beginning, so it remains to be seen whether she’ll lead the Seattle Storm out of the doldrums and into the spotlight in the coming years. The chances are she will. She combines the shot-blocking ability of Brittany Griner with the three-point shooting ability of Taurasi and Moore. More importantly, she has learned, as all UConn players do, how to keep things in focus. By practicing and doing warm-up drills at game speed, the Huskies learn to act instinctively and with confidence once they get into pressure-packed game situations. Who will be the next high school phenom that Geno has a chance to mold into a legend? We probably won’t have to wait too long to find out. Success attracts the best players who want to be challenged. And the best coaches are able and willing to oblige.